I remember when I got my first computer back in the early 80's. It was an incredible machine, with cool sound and awesome graphics! The Commodore 64 was the hottest thing around at the time, and we played great games like Test Drive, Winter Games and Rambo. All stored on recordable cassettes. 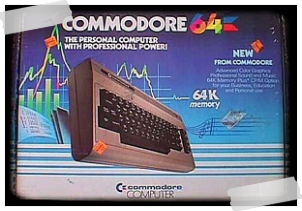 Ok, so the C64 isn't a revolution any more, with it's outdated graphics and cassette player. But, the games are still very playable and fun. It has become very popular to do pc remakes of classic C64 games, and some of these great conversions can be found in my Old Games Archive. However, many of the greatest C64 games can't be found as pc versions. This doesn't mean that you can't play them on modern pc's though. All you need is a neat little program to emulate the old Commodore machine, and suddenly your brand new pc shows you the classic blue C64 screen, allowing you to play all the good old C64 games! Below you'll find a free emulator and a small selection of some of the greatest Commodore 64 games. Download and enjoy some of the gaming gems from the past! Emulator needed to run Commodore programs/games. Currently, VICE is one of the most widely-used Commodore emulators, and it is also one of the few that is free. Cool fighting game with some great moves. This was my favorite flight game back in the 80's, and I still play it occasionally. A Polish game company has started developing a remake of this game for Windows. Check out their page here. Be prepared for the bumpiest ride of your life, over five of the roughest courses ever devised for four wheels. Who are you gonna call? The game from the first movie, and one of the best movie conversions ever made! Great karate game that is easy to learn and offers a variety of available moves. A real Wild West game. You play the iconic Rambo, a commando sent to Vietnam to free POWs. Spy Hunter was a pretty simple game in idea, but the gameplay itself was sometimes very hard. Battle yourself through the different levels, collecting power ups and weapon upgrades along the way. Compete in several events in the summer olympics. Awesome game!